A Sports Exhaust – for a sound investment! The purpose of an exhaust system is to allow the gases to exit from the engine and to reduce the noise at the same time. At the front of an exhaust system is the manifold one for each bank of an engine (two for V shaped engines and one for straight engines). Manifolds collect the exhaust gases from the cylinders and direct them down to the rest of the system. Normally made of cast iron, they reduce the amount of pipes required by directing several exhaust ports into either 2 pipes or more commonly one pipe. Manifolds are also known as the front pipe or down pipe. All cars nowadays have a catalytic converter straight after the down pipe. Basically catalytic converters help reduce the carbon monoxide, unburned hydrocarbons (fuel) and nitrogen oxide from exiting the engine and out into the atmosphere. They operate only when sufficiently warmed by the exhaust gases. The rest of the exhaust system is made up of silencers/resonators and piping. Some cars have a central silencer/resonator and a silencer at the back, while others just have one silencer at the back. Silencers are made up of tubes that cancel out the sound waves produced by an engine. Most original silencers are filled with sound-absorbing fiberglass or steel wool that also helps reduce the noise. Original exhaust systems are normally made from mild steel. A quick word about the gas flow out of an engine. Gases flowing out of the engine are not continuous, they pulse. This pulse is caused by the exhaust valves opening and closing as the engine lets air/fuel in, combusts, and then lets the gases out. This causes high and low pressures at the beginning and end of each pulse, get the flow right and each pulse will pull the other one along more efficiently. Aftermarket Sports Exhausts are sometimes considered to be a controversial step to take, as many aftermarket companies sell systems haphazardly thrown together. But gains can be made from a good system. Remember there can be compromises when it comes to power increases, some systems will increase the BHP, but reduce the torque, just beware. The noise that some of these systems make is also an attractive feature, as long as you stay within the law. Combine a good system with a performance air filter for best results. 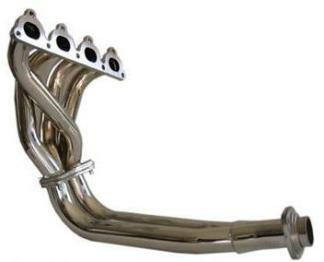 Standard exhaust manifolds are usually quite restrictive to the flow of exhaust gases. Manufacturers in order to keep costs down, tend to make the standard manifolds as cheaply as possible, with minimum thought to air flow. Basically the original manifolds may have misaligned exhaust port to manifold holes and badly designed chambers. This causes a higher back pressure than necessary and therefore the engine has to work against this, robbing it of power. Aftermarket performance manifolds however have been designed with more precise alignment with the ports, smoother construction and gentler curves. They are designed with the timing of the pulse in mind and can help the flow, reducing any restrictions. A good tubular steel or stainless steel manifold apart from being lighter than the cast iron manifolds can see some nice power gains, but they are expensive. Ceramic coated manifolds are available, where the coating helps reduce the lose of heat, keeping the temperature in the engine bay cooler, but again these tend to be quite expensive. The best design to go for would be a 4-2-1. That means that the four pipes coming from the ports go into two pipes, then into the one pipe (obviously for a 4 cylinder engine, or one bank of a V8). This design allows for a much smoother flow of the gases. Also consider the 4-2-2 design which will allow a twin exit tail pipe. Although some exhaust systems have a single silencer that has a pipe on either side exiting to do this also (usually at the expense of air flow). You can also have your manifolds ported and polished. This entails the manifolds ports being matched to the outlet ports (exhaust ports), so that the air doesn’t hit the protruding unmatched manifold port and having it polished to remove any rough edges to aid in the air flow. 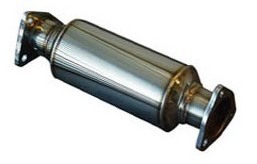 Fitting a cat bypass pipe (decat pipe) or a performance catalytic converter may gain a few hp. One thing to watch out for is if you decide to go this route, find out if your car has a catalytic converter recognition sensor, some modern cars computer will throw up the engine management light if it expects anything is wrong with it. Silencers are just that, they help reduce the noise from the engine and without it we wouldn’t be able to talk to each other inside or outside the car. Again the original systems are normally made to a cost and therefore you may be able to improve upon it with an aftermarket system. For me the added roar on some systems is worth it alone. 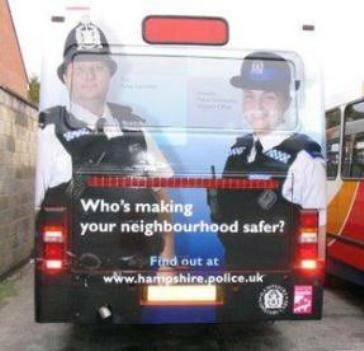 Although it’s important to stay well within the law. Most after market companies will say that you should see gains of between 2-12 BHP from a full sports exhaust system, but we doubt that the upper quote will be realized unless the original system was very bad. Look for ones that have a proven record. 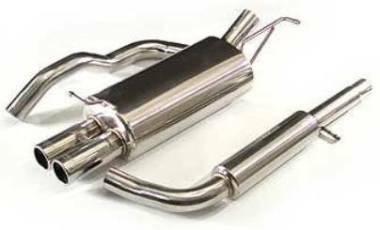 There are many different types of aftermarket exhaust systems and different materials/designs being used to absorb that sound. Most aftermarket systems have a single baffle in their silencer that allows the air to flow in a straight line through the silencer. Many use a resonator. A resonator is a chamber that… well resonates the sound to alter/reduce the pitch. Some aftermarket systems employ them in their tail pipe to tune the noise. Turbocharged cars systems, due to the turbine being sited in the manifold tend to be made with less restriction than others, as the turbine already does a job in quieting the noise from the engine by creating some back pressure. The cheapest way to upgrade your exhaust is to replace the back box only. This potentially could give you a couple of BHP more and give better throttle response and look and sound good as well. Oh and don’t forget a nice shiny chrome tail pipe. We don’t really have a recommendation here, it all depends on how much money you want to spend. However a good stainless steel cat back system is good value, if you plan on keeping your car for a while. If you can afford the manifold, downpipe and a performance cat with it, great. Also find out from reviews and tests which aftermarket manufacturers have consistantly good reports for what you are looking for. Final Word – My pipe is bigger than yours! An overly large exhaust pipe will destroy the flow characteristics (velocity of air, which will hurt torque), slowing it down and destroying the pulse sequence. Just remember that the larger the engine the larger the pipes can be, up to a point. No one really needs to have more than 3-3.5 inch pipes and less for cars under 2 litres, although some high power applications maybe ok with up to 4 inch pipes. If you are considering an aftermarket sports exhaust and it doesn’t follow the original exhaust route, watch out for ground clearance. With all this talk about the size of your pipes, see the pic below, no wonder she’s smiling (you can’t tell me that they didn’t know it was going to look like that?